Yesterday I had a Computer-Free Day. I can’t remember the last time I had one of those… except perhaps on holiday. But I wasn’t on holiday; I was at home, in Amsterdam. My laptop was right there, and I resisted opening it for an entire day. It was slightly boring, but also strangely liberating. It was like life ten years ago: I looked up my dinner destinations in my A-Z rather than on Google Maps. I searched for a translation in an actual dictionary, instead of using Google Translate. I texted a friend about where we were meeting, instead of pinging her a message on Facebook. And when I logged in again precisely 39 hours later, I discovered I had missed absolutely nothing. Friday night was Wilde Zwijnen, just off Javaplein, which is an area of Amsterdam I’m not familiar with and was pleasantly surprised by. There were 30 minutes of blissful, unexpected sunshine just as I arrived, so I sat with my face turned up towards the elusive yellow star like a deprived flower. I had a glass of Sauvignon Blanc and browsed the menu; it was without doubt my favourite moment of the day. 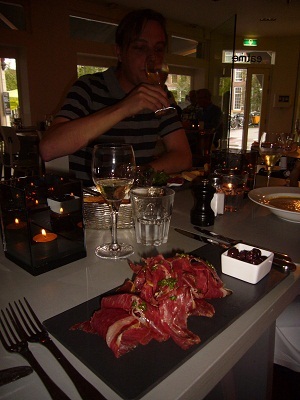 The odd thing about Wilde Zwijnen is that there isn’t a single morsel of wild boar to be found. A missed opportunity, don’t you think? So, failing boar, I had a tomato tarte tatin to start, followed by a pork chop. The tarte tatin was a little flabby on the pastry, but the tomato and onion topping was sweet and delicious, and the salad tasted properly green. It was scattered with shavings of mature cheese and dressed with peppery olive oil. It left me wanting more – in a good way. The pork chop was just as pork should be: succulently underdone and oozing with juice. 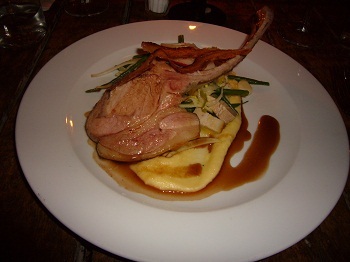 It was served with cubes of belly pork and a combination of raw fennel and green beans. It also came with pureed potato, but it had been seasoned with so much lemon that I could no longer taste the earthy, comforting stodge of mash. 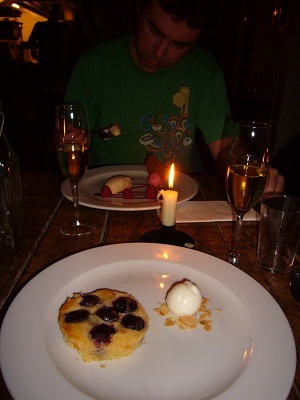 Dessert was ‘Boerencake’, which seemed to be the Dutch answer to cherry clafoutis. It came with karnemelk sorbet, to add to the Dutch effect. I wanted the recipe for both. 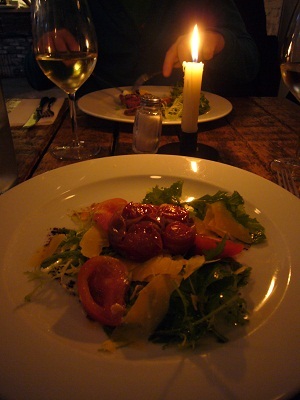 We had an aperitif, as well as a bottle of wine during dinner and a glass of dessert wine to follow, which meant our bill came to €60 each. 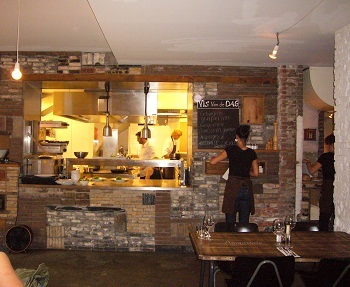 But you could eat well at Wilde Zwijnen for under €50, and I probably will soon. Saturday night was Eatme, whose first impressions were some kind of pink and purple, luminescent, spider’s web wall, and a leafy jungle of foliage through which to walk to enter. I wasn’t crazy about the décor, but it was certainly memorable. Also memorable, but in a better way, was the service. Our waitress seemed to be working alone, but she was tirelessly cheerful, efficient and helpful (especially at the end when I tried to leave half my belongings in the restaurant). The food wasn’t bad either. I had a plate of thinly sliced, cured beef (kind of Spanish charcuterie) to start: simple but good quality. My main came in a cast iron pot, whose lid was lifted off at the table in a steamy flourish. 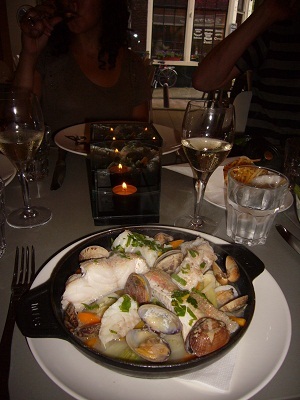 It was full of cod, red mullet, clams and other fishy goodness, swimming in a light (possibly Pernod-flavoured?) broth with fennel, carrots and potatoes nestled in between the seafood. Fresh and bread-moppingly good. The summer veges and green salad on the side were excellent too. Feeling rather full after my mammoth vispotje, I opted to share a ‘bucket’ of scroppino for dessert: a slim carafe of lemony slush arrived in a bucket full of ice with two champagne glasses. A light, refreshing end to the meal. Dinner was similarly priced to the night before, and similarly good. 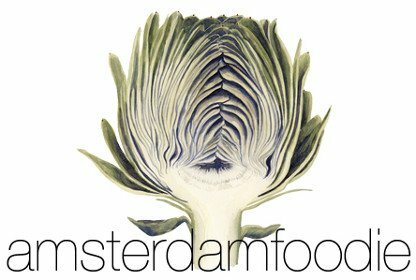 All in all, a very satisfying weekend: a little more eating, a little less Googling.